Best friends are made at Carle Irish Dance! Join our Carle Cuties program and experience the one of a kind community that Carle Irish Dance offers. With over ten years experience in teaching Irish Dance in the southern tier, we are focused on educating, inspiring and motivating each of our students in a safe and nurturing environment. Offering classes in Endicott, Horseheads and Sidney NY we have plenty of options to best fit your busy schedule. At the Carle School we excel at engaging the young dancers’ minds and bodies using fun, age appropriate music in conjunction with traditional jigs and reels. Incorporating a variety of props (cones, hula hoops, jumping ropes) we make each class unique and, most importantly, fun! 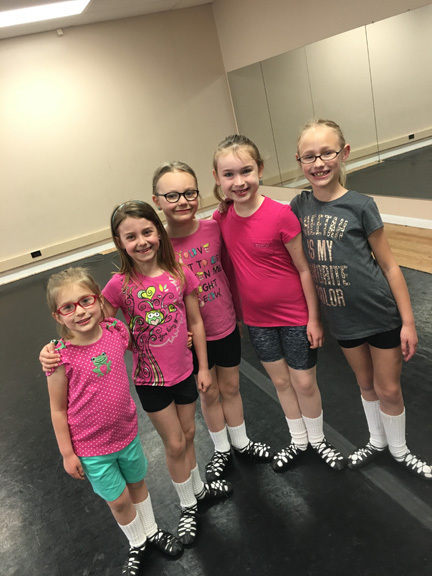 Our Carle Cuties classes are geared for dancers (ages 5 and up) that have either graduated from our Tiny Tots program or are brand new to Irish Dance. We do occasionally accept 4 year olds into our Carle Cuties program after a brief screening. During our Carle Cuties classes we will introduce your dancer to the basic building blocks of traditional Irish Dance: Skip 2,3’s, Sevens, building up to reels and jigs and specially choreographed dances to perform throughout our community during St. Paddy’s March Madness. Carle Cuties Summer classes begin the week of July 10, 2017 through August 17. All Carle Cuties workshops are $70 for the 6 week session. Carle Cuties Tuesdays 5:30 – 6:15 p.m.
Carle Cuties Wednesdays 6:15pm – 7:00 p.m.
For information on classes for children (ages 2 – 4) visit our Tiny Tots page.